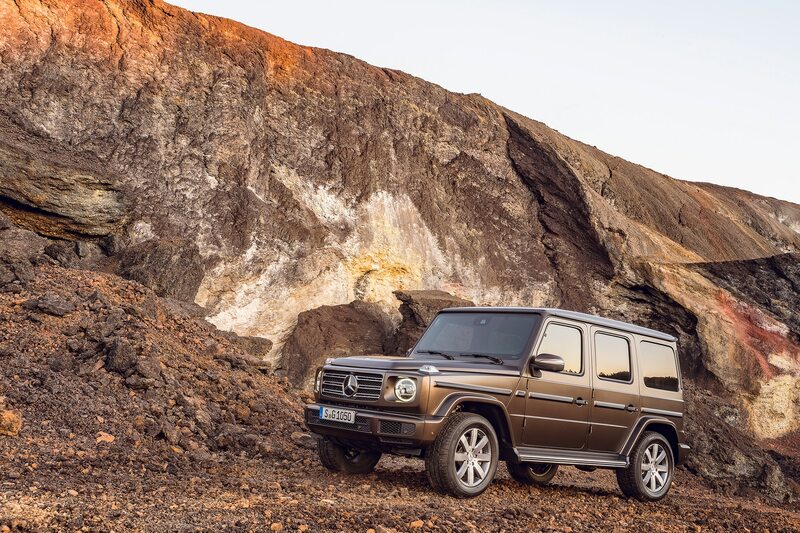 After a string of teasers, spyshots, and a peek at a barely camouflaged test mule, the 2019 Mercedes-Benz G-Class is finally unveiled in its full, straight-edged glory. 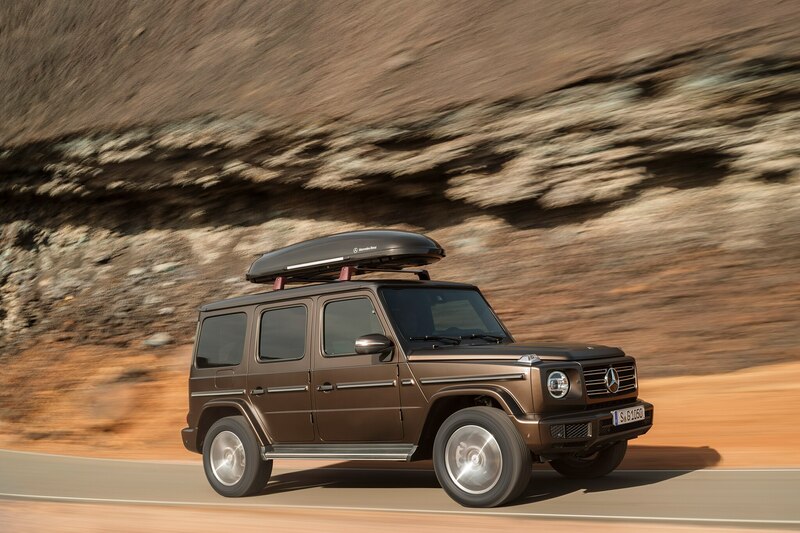 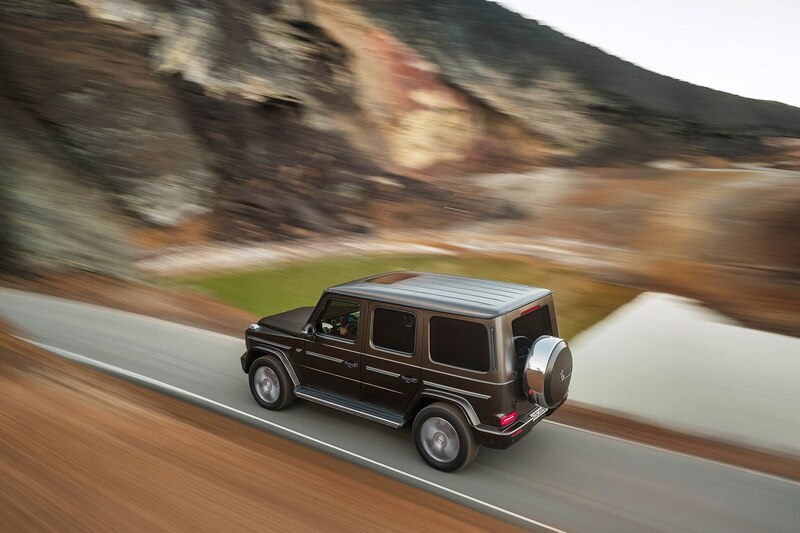 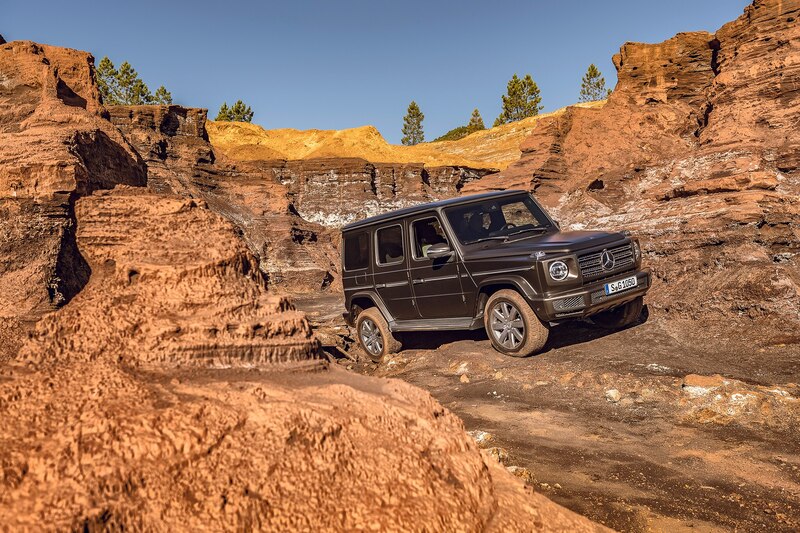 As we already saw from the earlier test mule, the new G-Class is as boxy and square as Geländewagen fans had hoped. 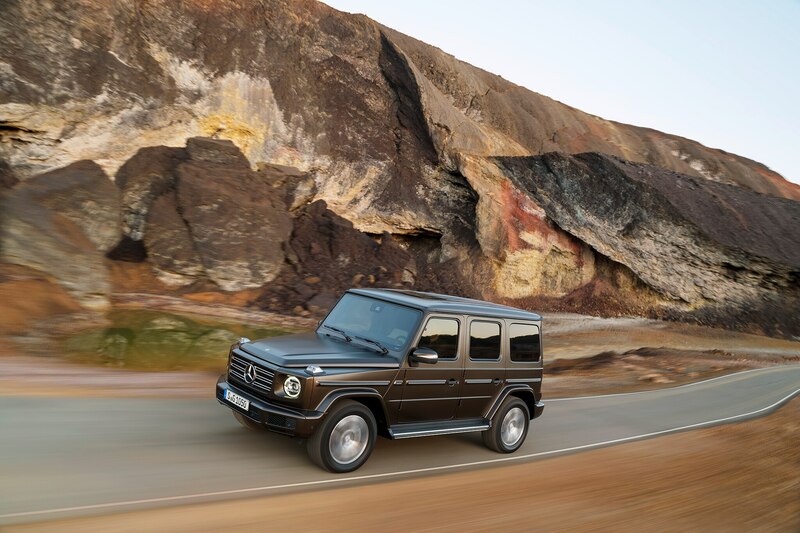 While the classic cubic styling remains, everything under the skin is all-new for 2019. 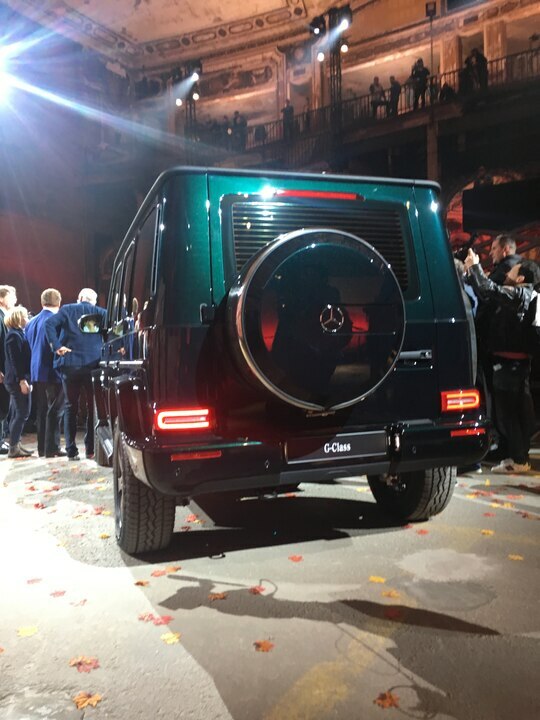 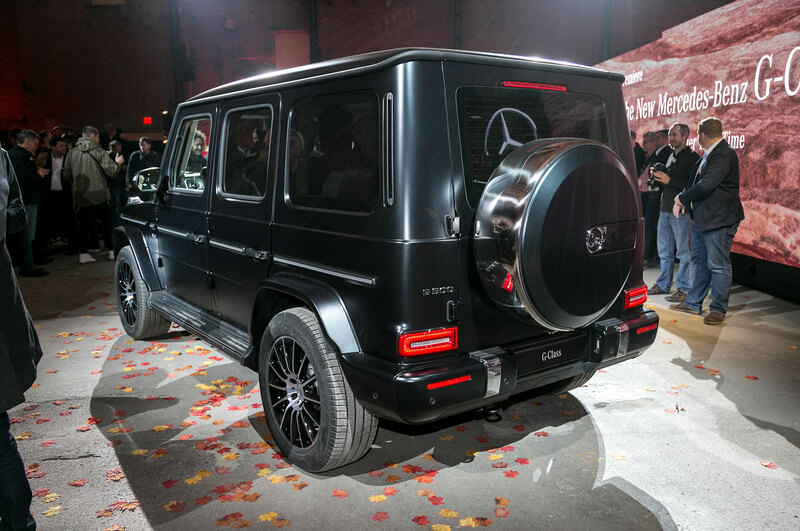 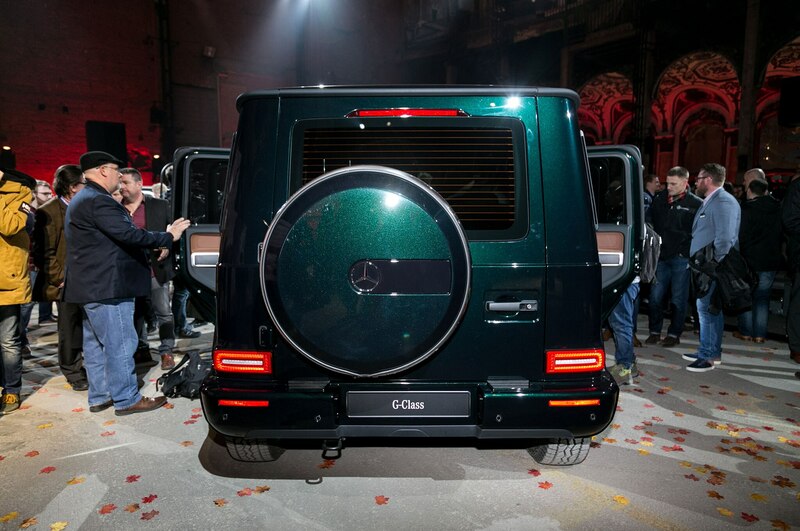 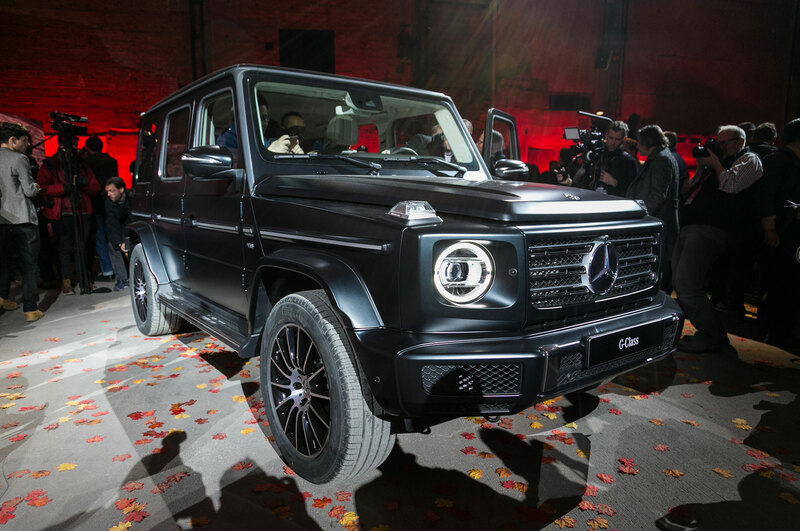 From the outside, the new Geländewagen looks nearly identical to the outgoing model. 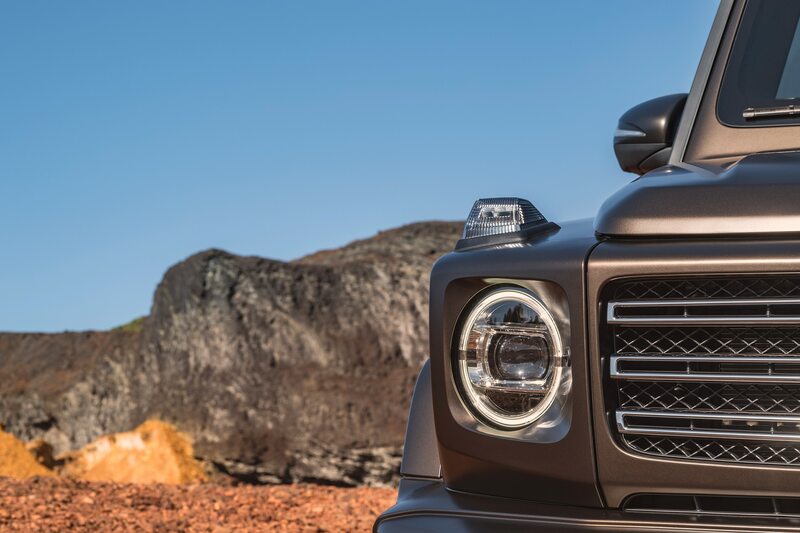 Aside from a few changes to the front grille and an all-new set of headlights, the Beverly Hills bomber is as boxy as it ever has been. 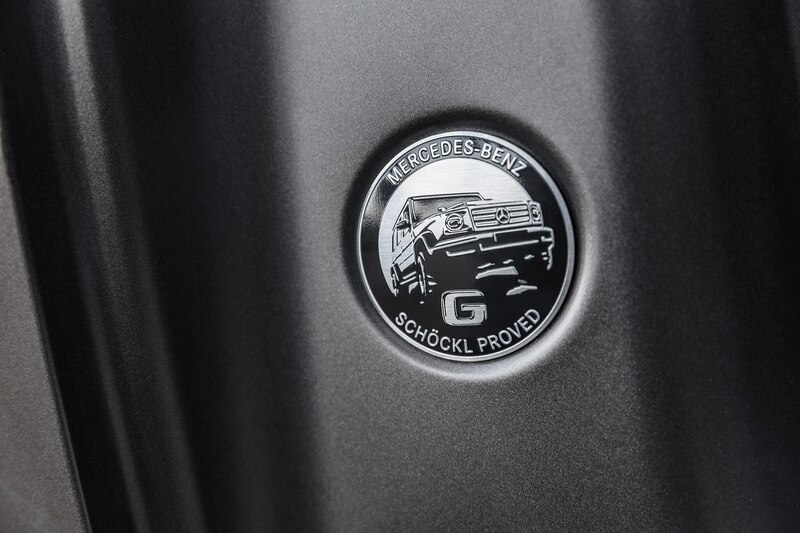 Despite the familiar design, the new truck is 2.1 inches longer and 4.8-inches wider than the outgoing generation. 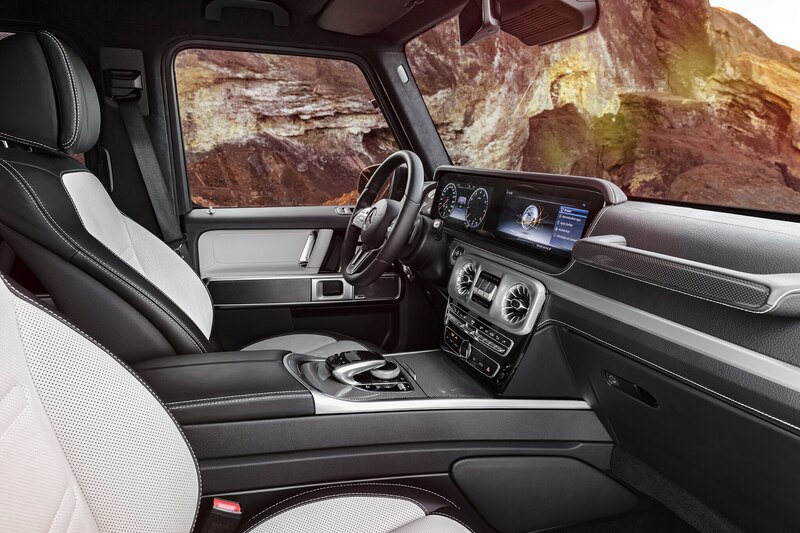 Inside, the changes are much more significant. 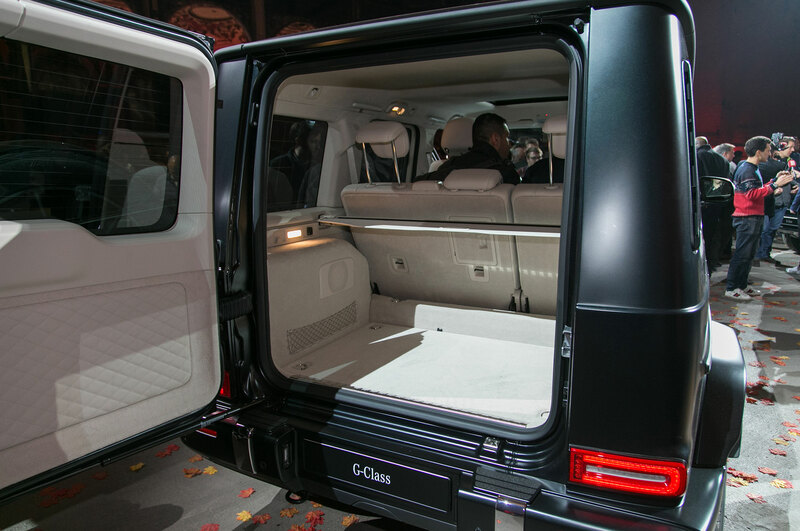 While the outgoing generation featured a leatherbound environment replete with the high-spec leather, rear infotainment, and premium materials, Mercedes engineers were forced to work around the G-Class’ restrictive dimensions, resulting in a cockpit that was unfriendly to seemingly anyone above 5’9’’. 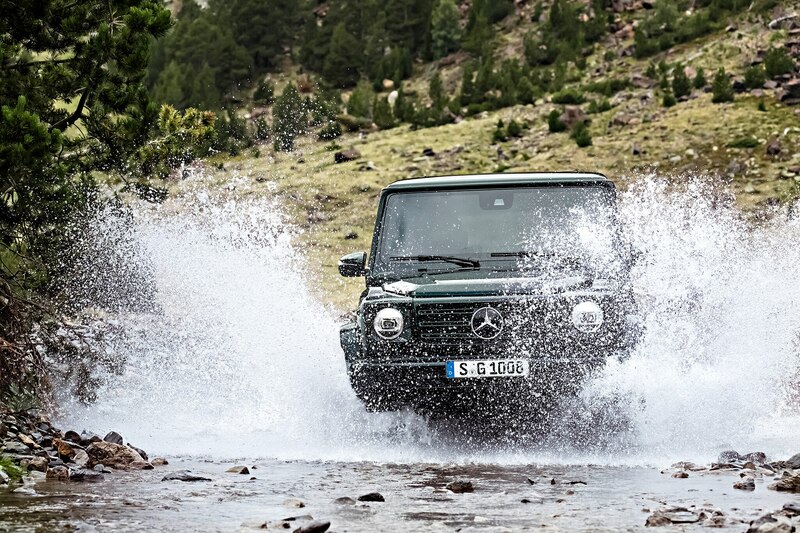 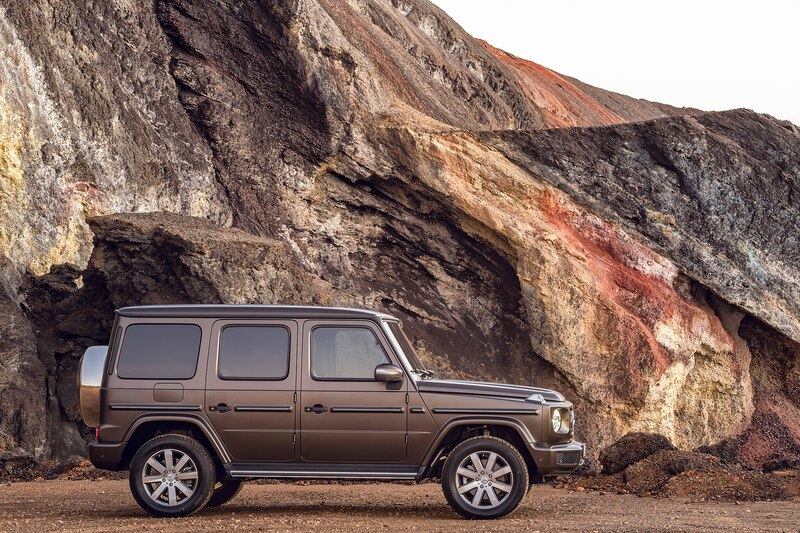 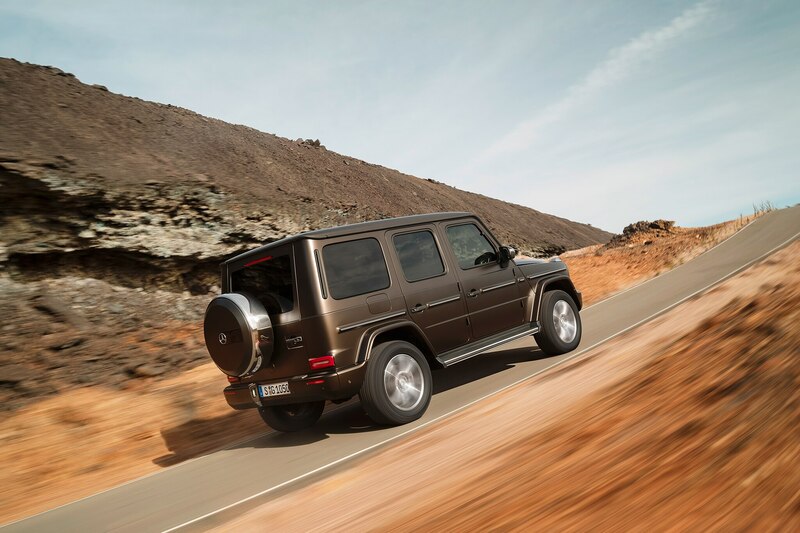 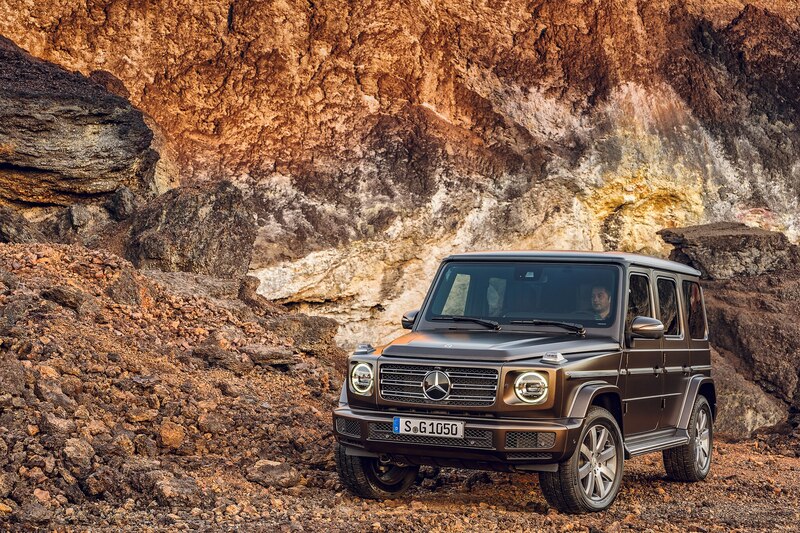 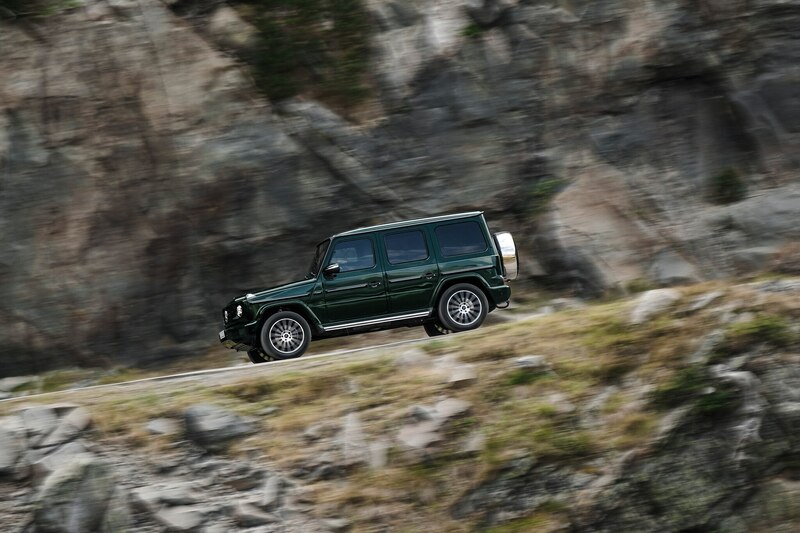 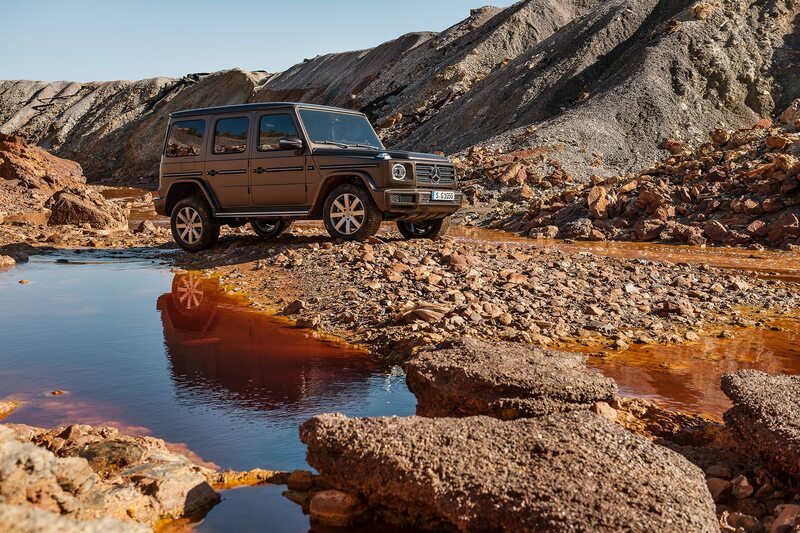 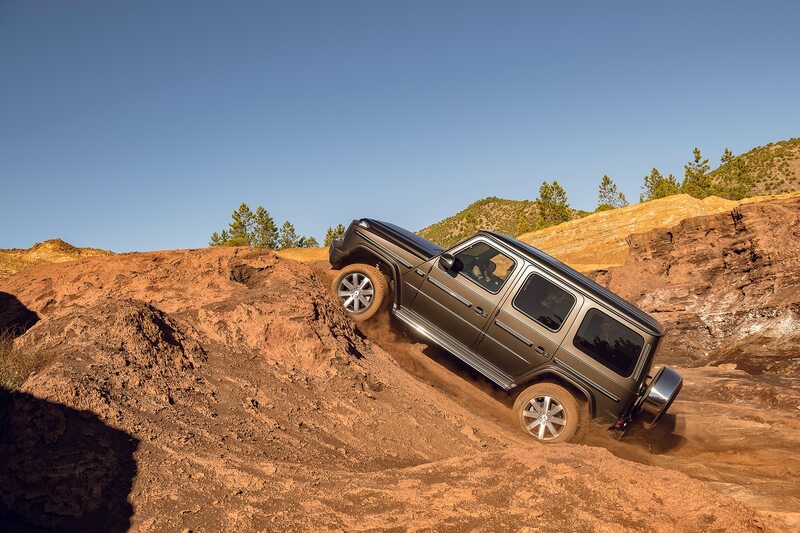 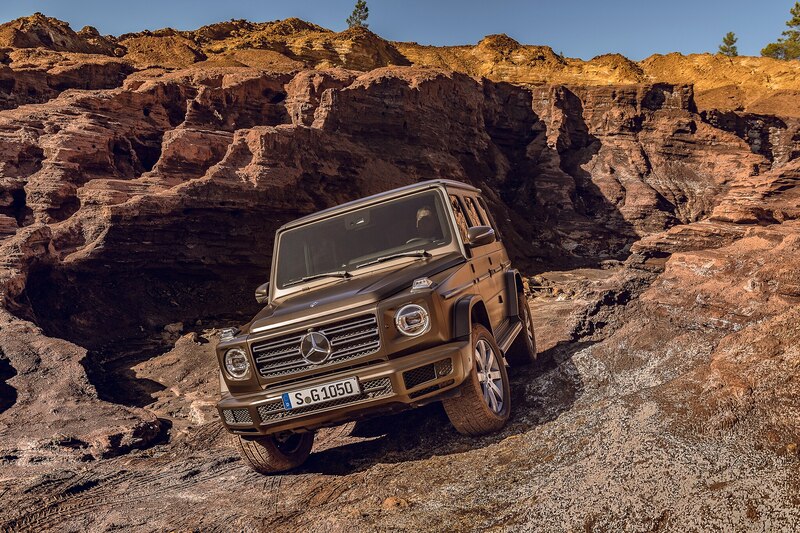 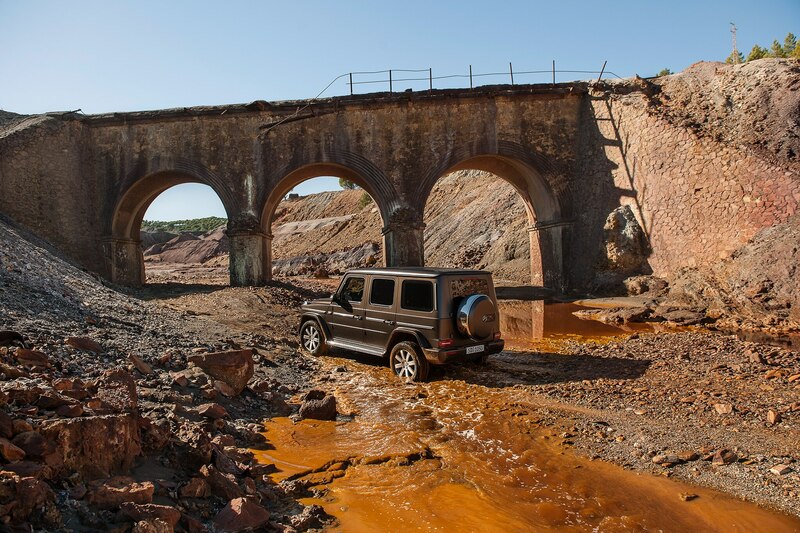 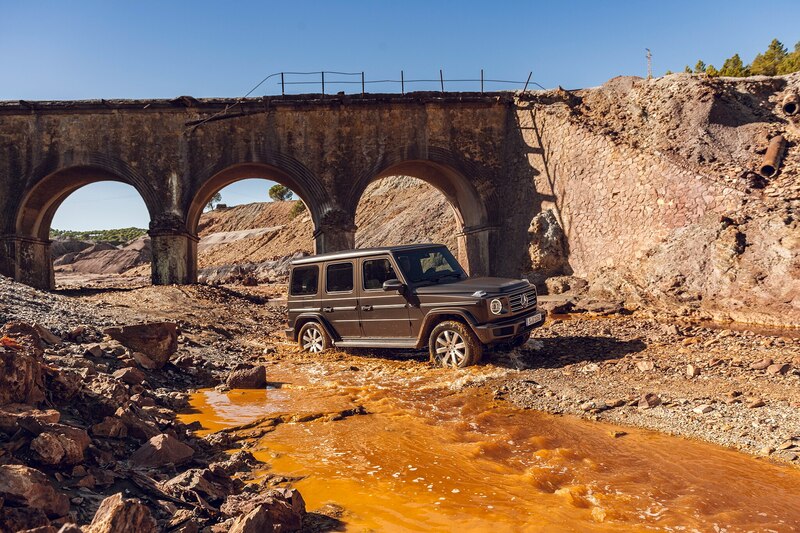 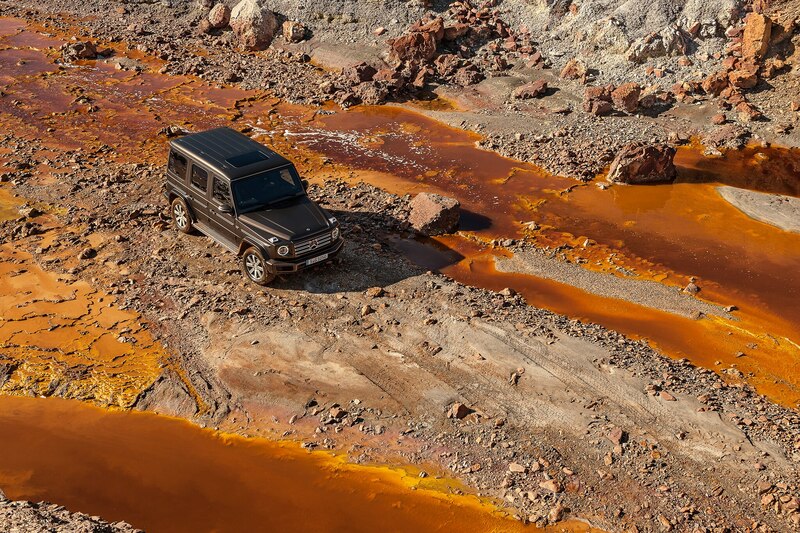 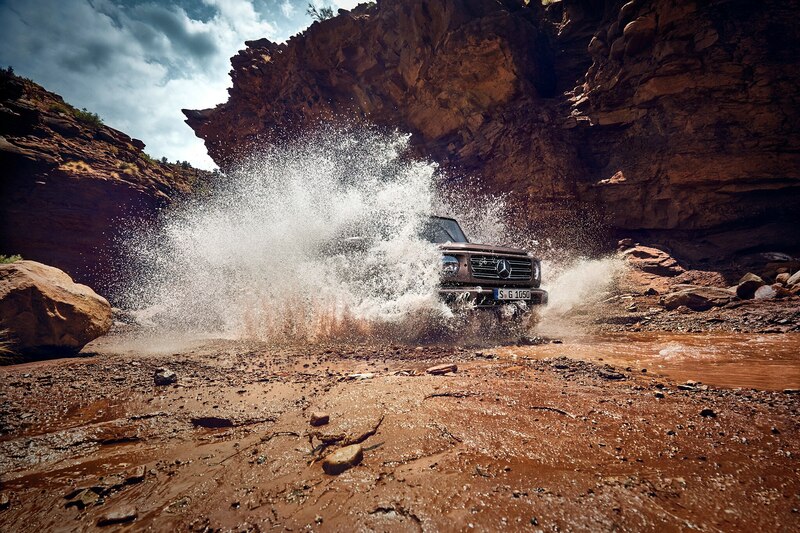 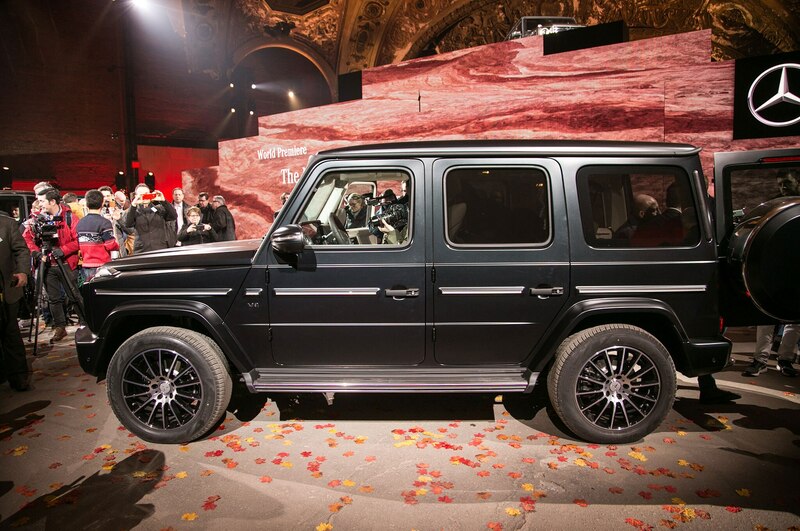 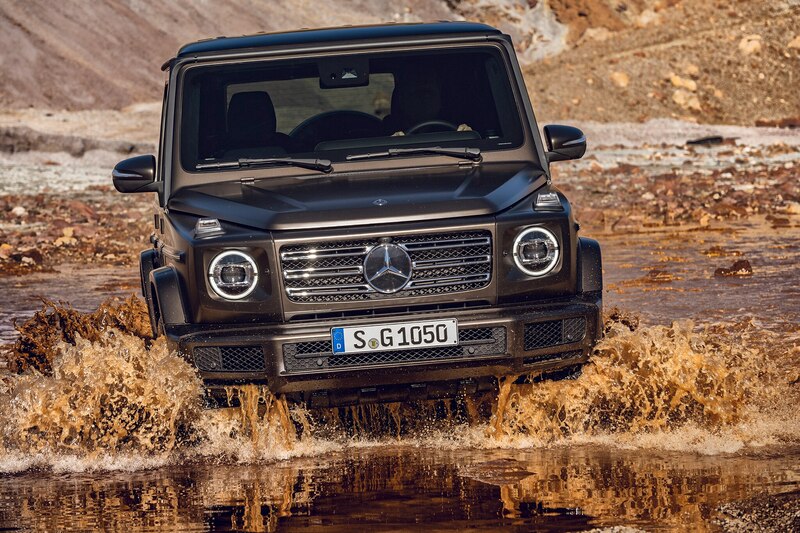 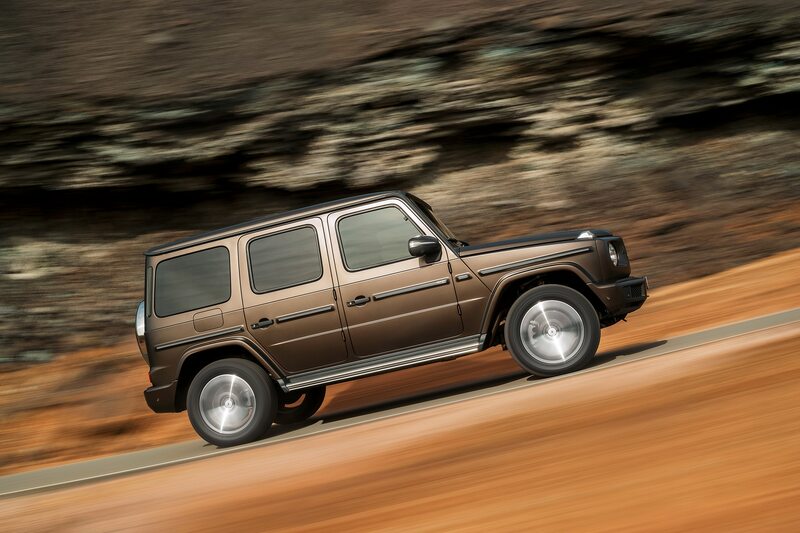 The older G-Class felt very much like an upfitted military vehicle with all the requisite compromises. 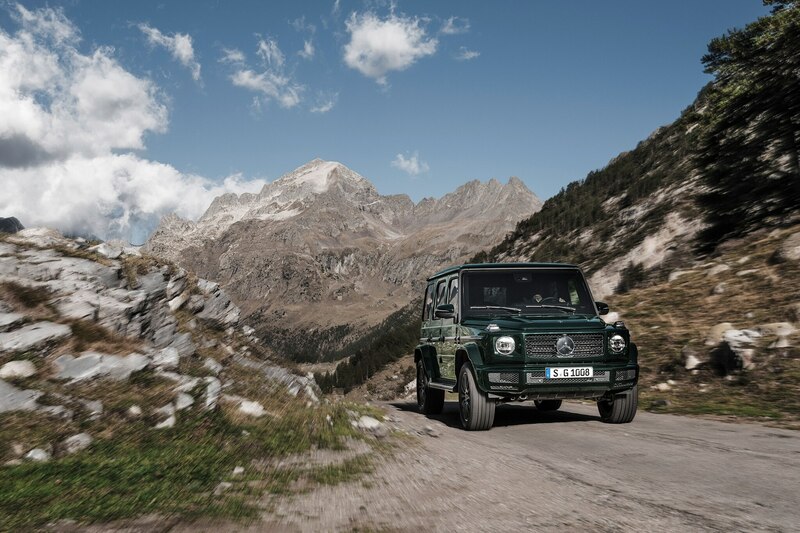 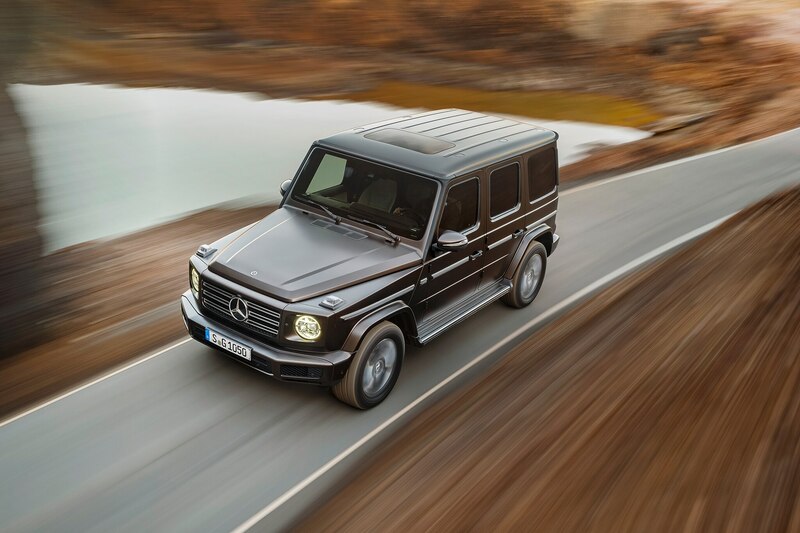 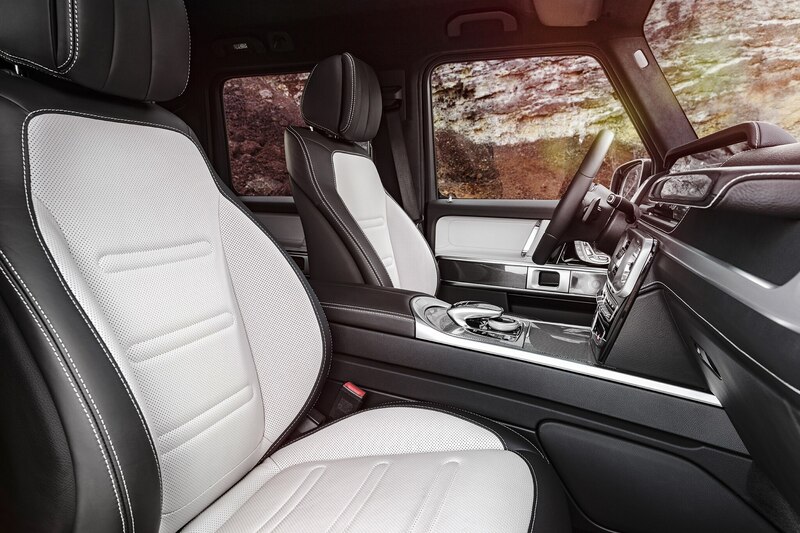 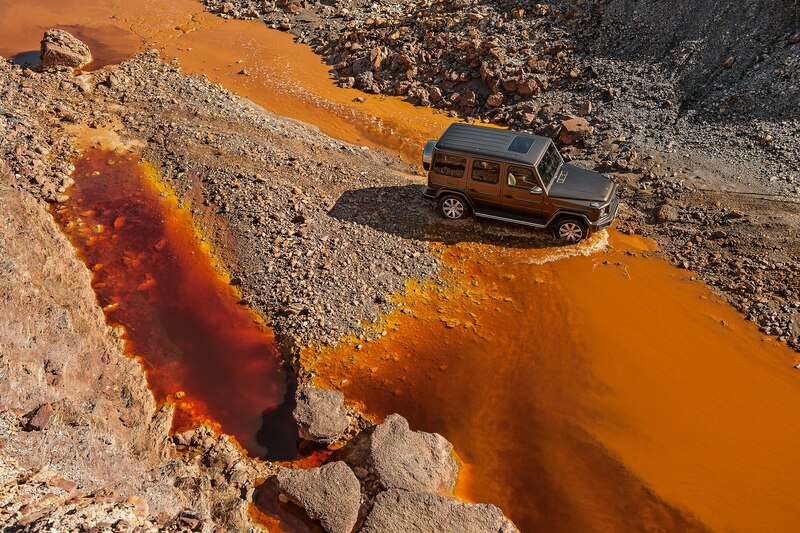 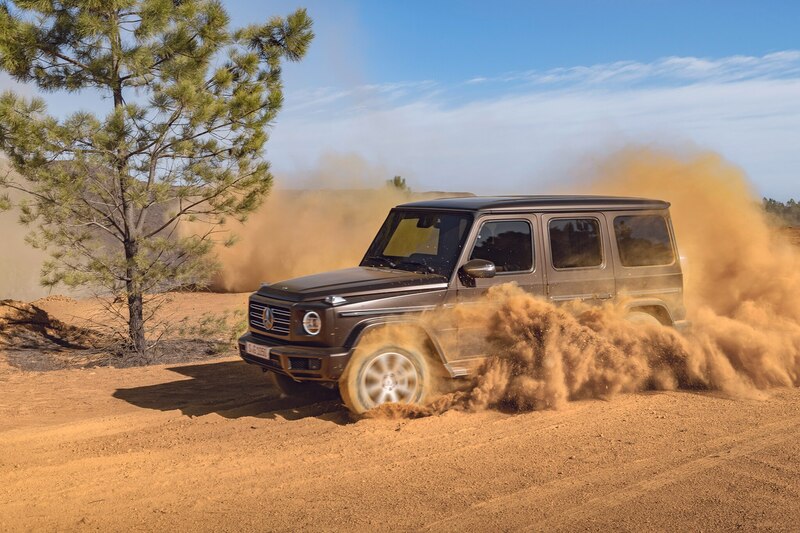 For 2019, the G-Wagen is more spacious and luxurious than ever before, incorporating materials and interior design pulled straight from Merc’s current lineup. 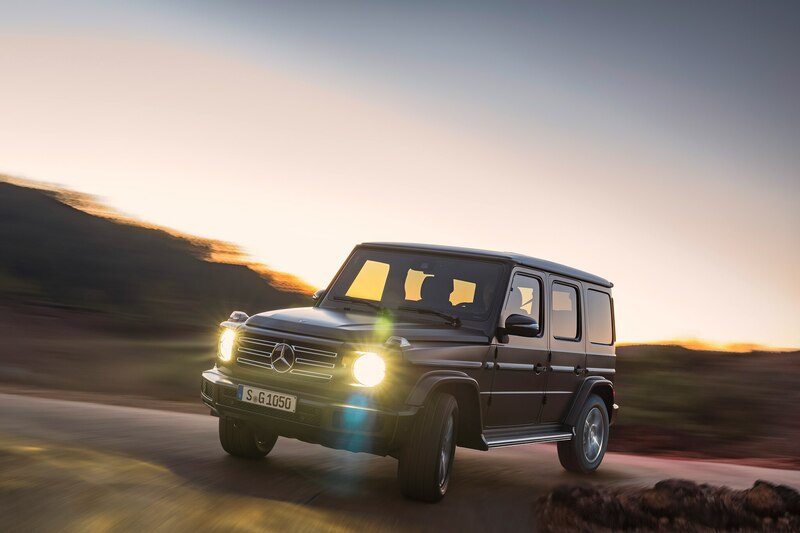 Everything appears redesigned or changed—from the steering wheel, to the starter button, and center console. 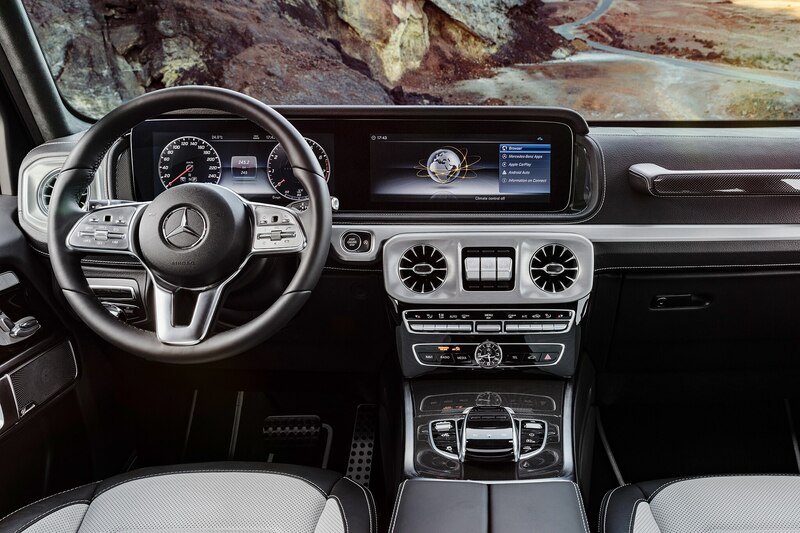 Mercedes also incorporated the new 12.3-inch Comand display that serves as both the gauge cluster and the infotainment display. 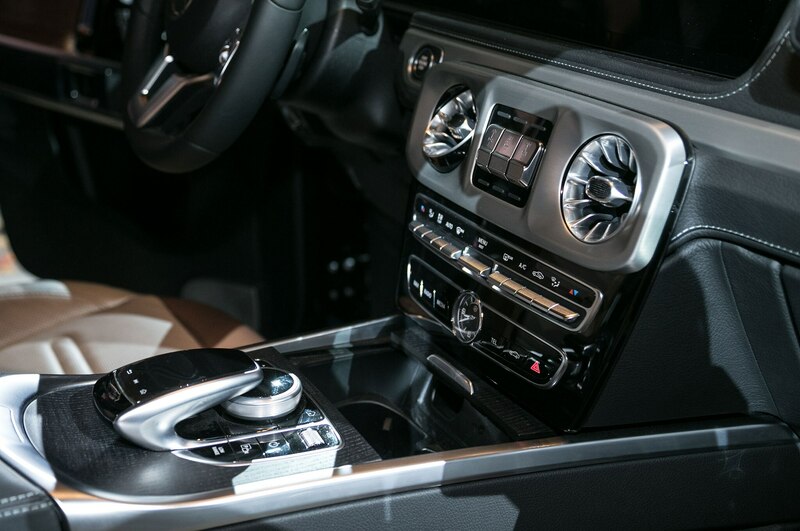 There’s even touch controls on the steering wheel, much like you would find on the newest S- or E-Class. 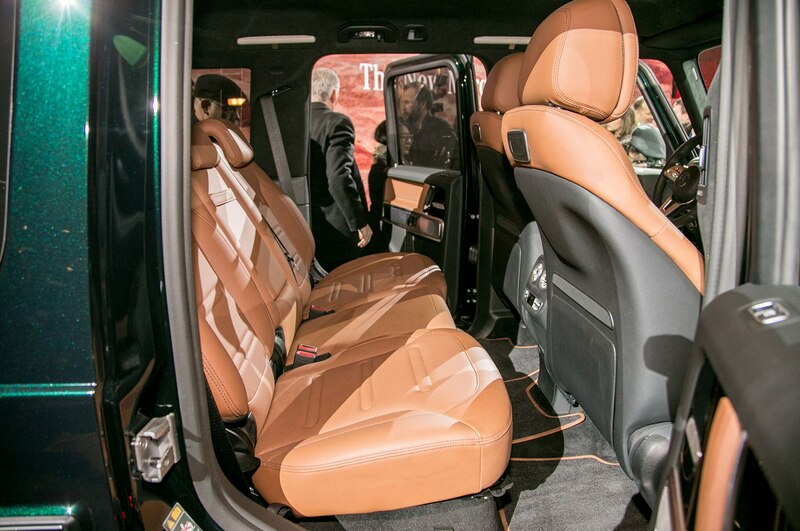 The new truck solves the cramped quarters as well, capitalizing on the exterior dimension stretch with an additional 1.5-inches of front leg and shoulder room. 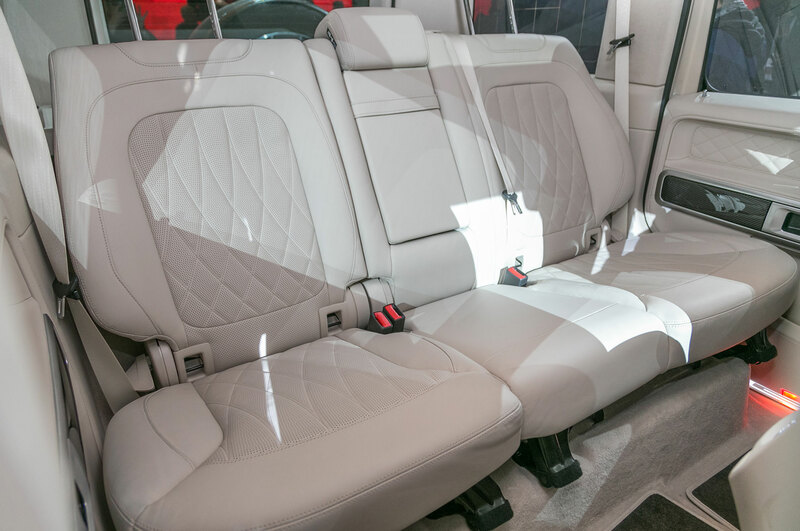 Passengers in the back will be far more comfortable, with an additional 5.9-inches of legroom and 1.1-inches of shoulder room. 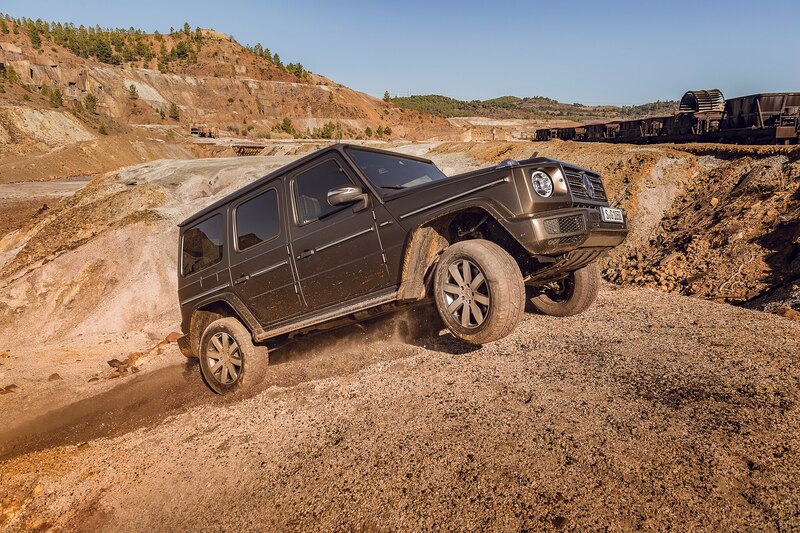 Despite all of these quality-of-life changes, the new G is more off-road capable than ever. 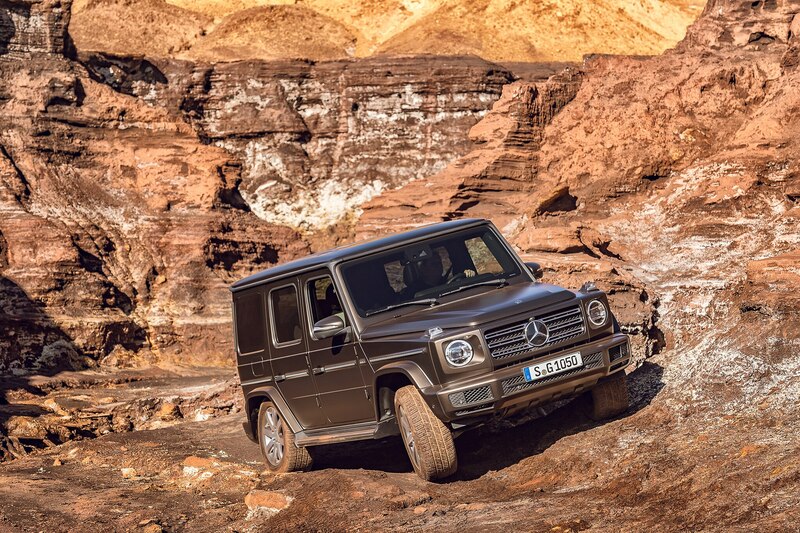 Engineers worked extremely hard on preserving the mountain goat personality of the G, resulting in an improvement in off-road performance across the board. 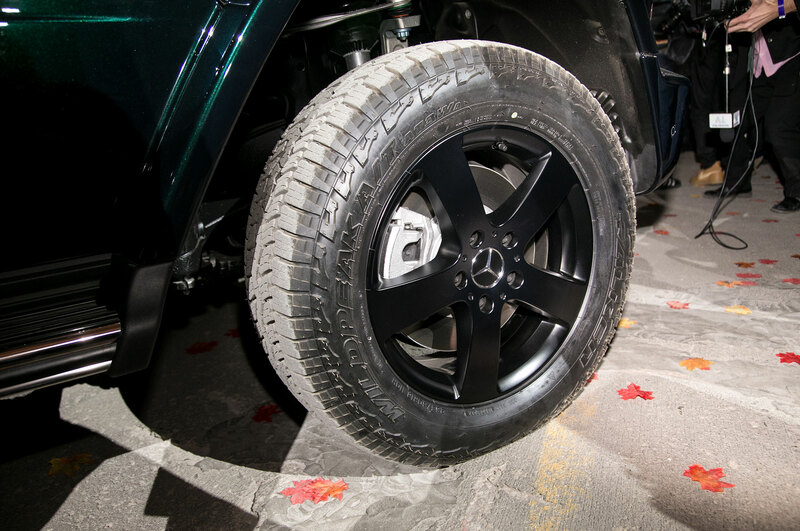 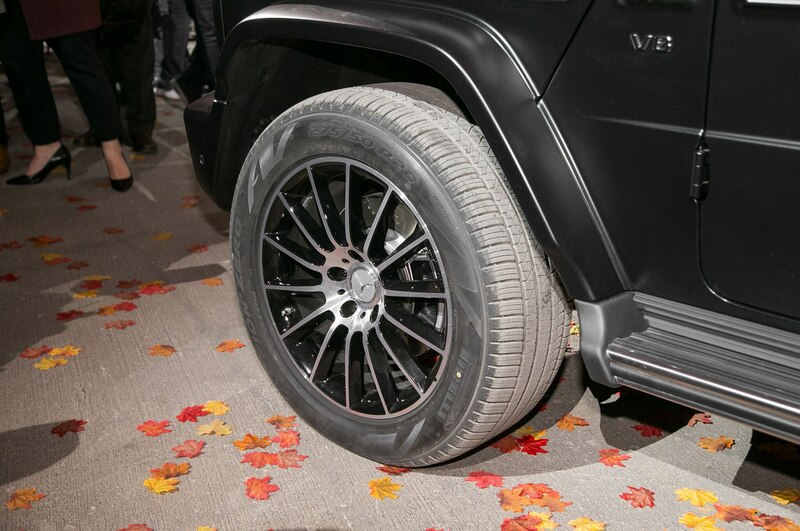 Ground clearance has jumped by 0.2 inches to 9.5 inches total, alongside a 3.6-inch boost in maximum fording depth to 27.6 inches. 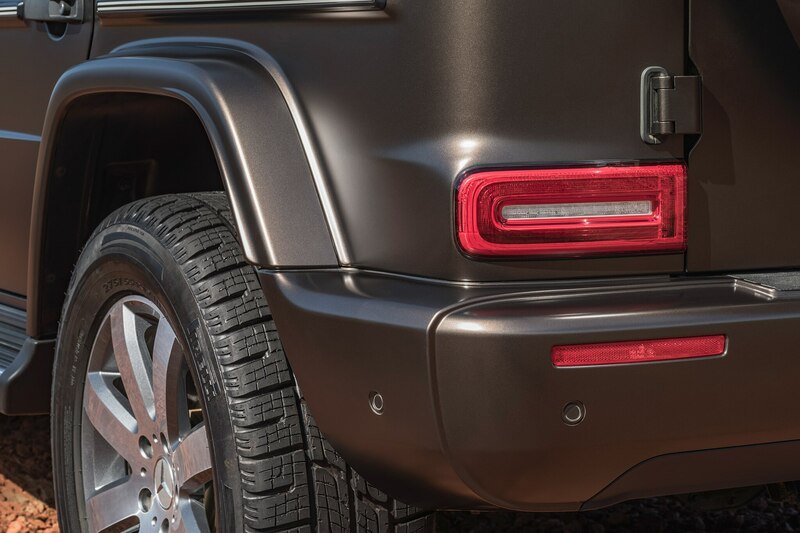 The maximum angle off approach is improved by one degree over the older truck. 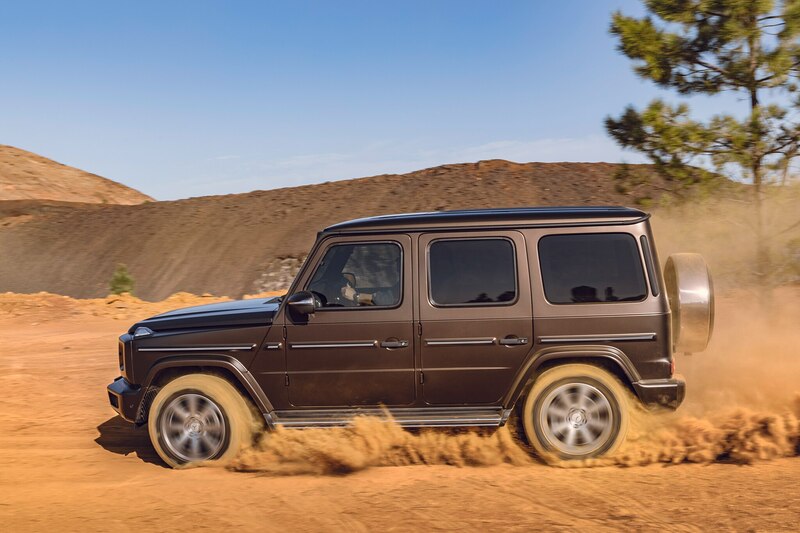 There’s still three 100-percent locking differentials, along with a solid-rear-axle. 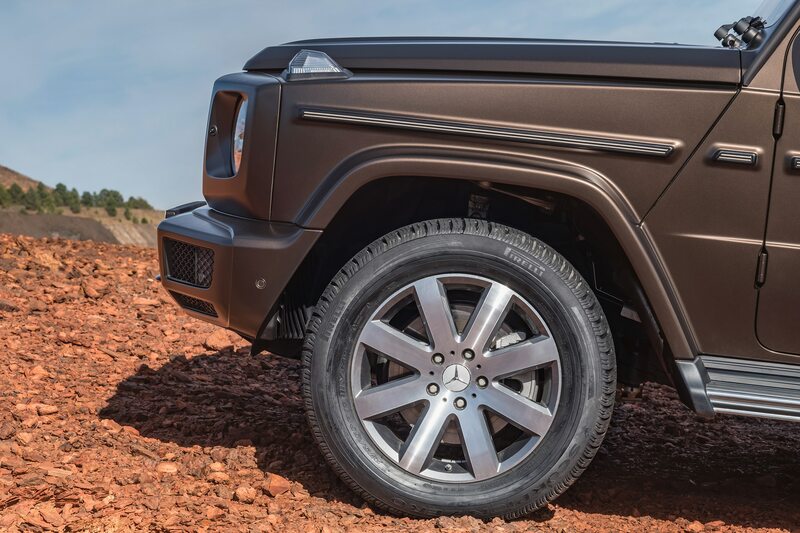 Up front, a new independent suspension incorporates a double-wishbone design, improving ground clearance and likely improving on-road manners as well. 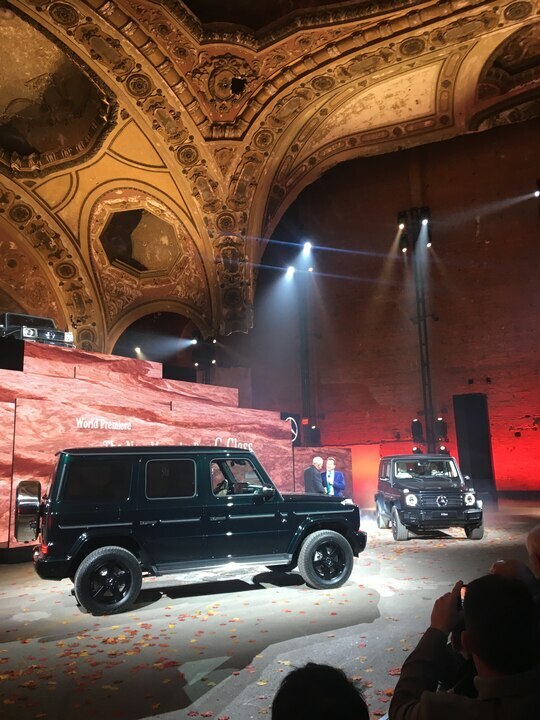 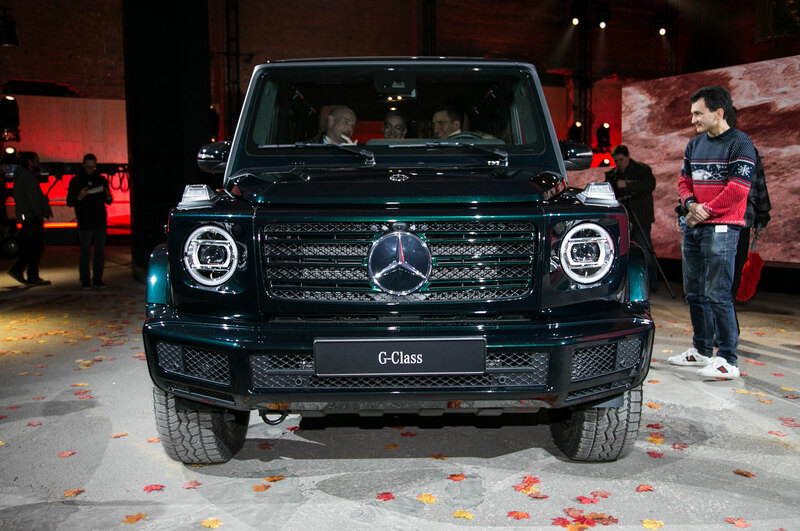 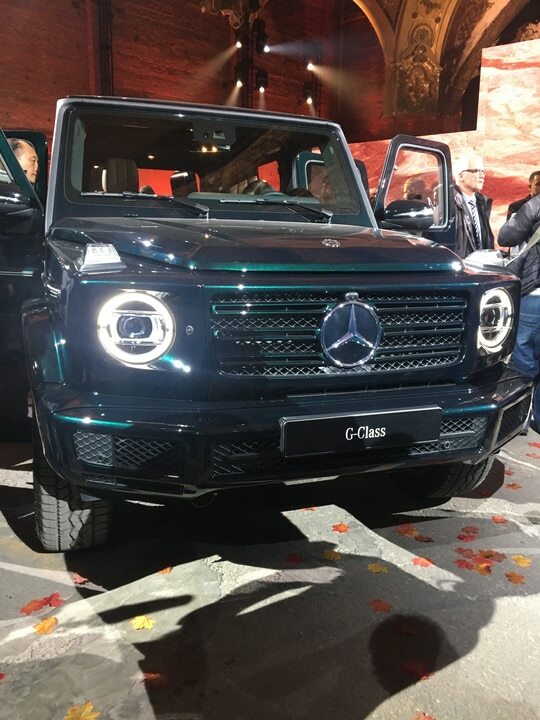 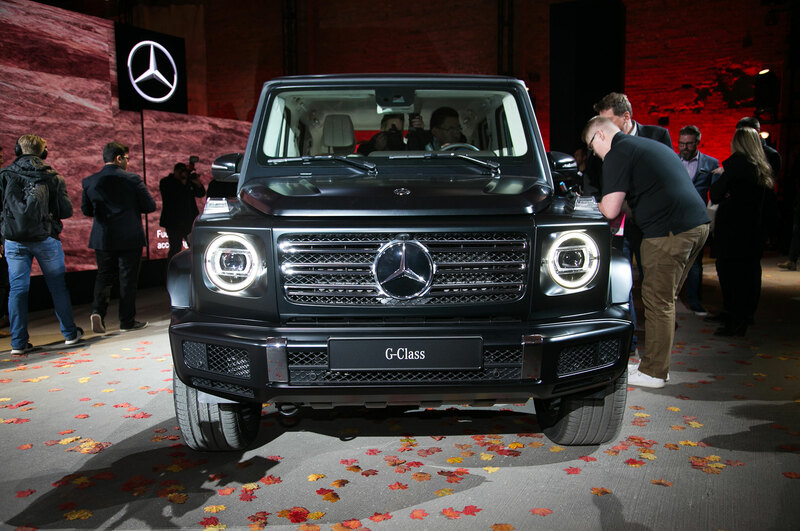 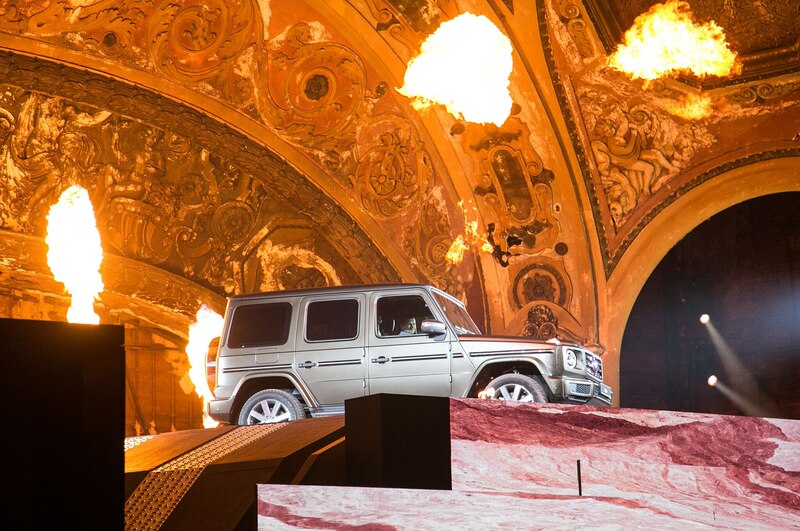 The 2019 G-Class adds a new “G-Mode” setting, similar to the existing Sport and Comfort driving modes. 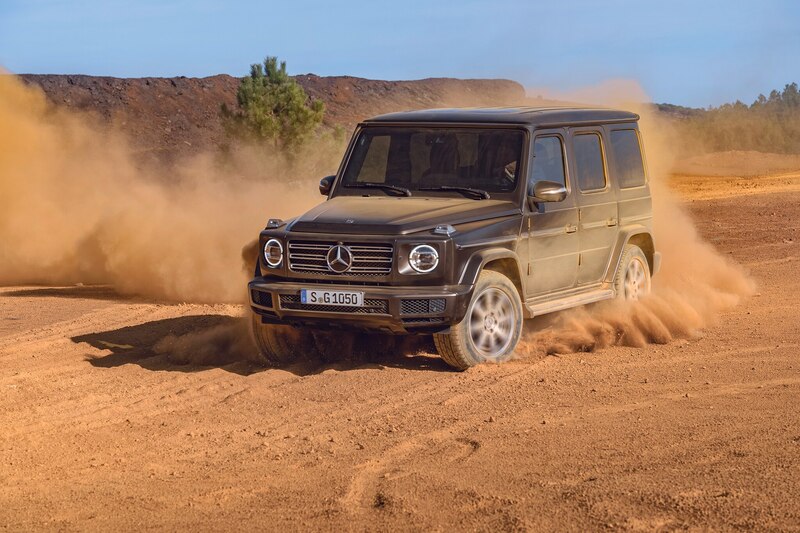 In G-Mode, the truck optimizes the suspension, steering, transmission, and throttle mapping for ideal performance in a low-speed off-road environment. 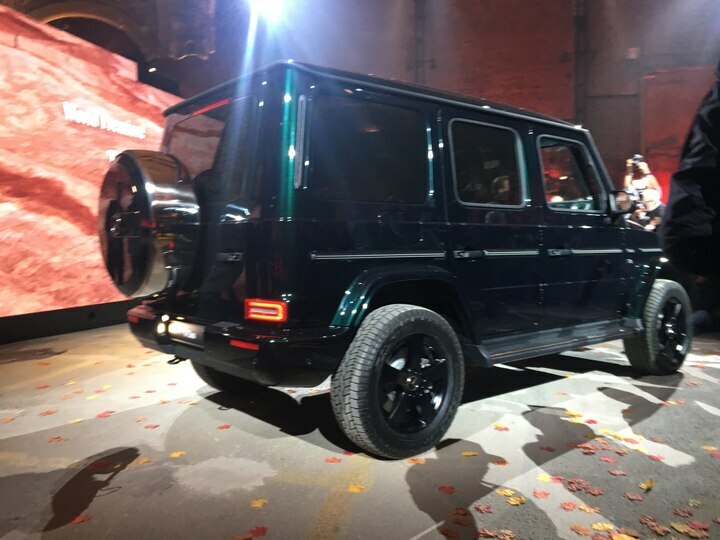 Surprise, surprise—the only powertrain available at launch is a V-8. 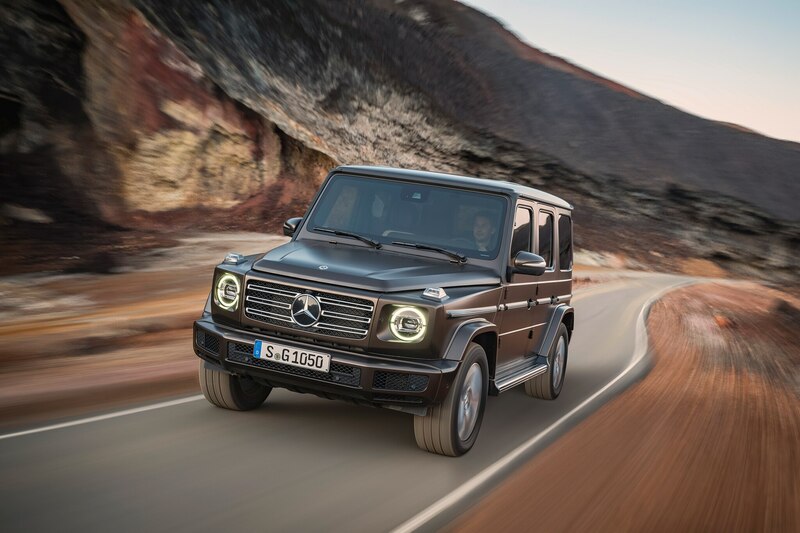 Power comes from Mercedes’ ubiquitous 4.0-liter twin-turbo M176 V-8, pushing 416 hp and 450 lb-ft of torque to all-four-wheels. 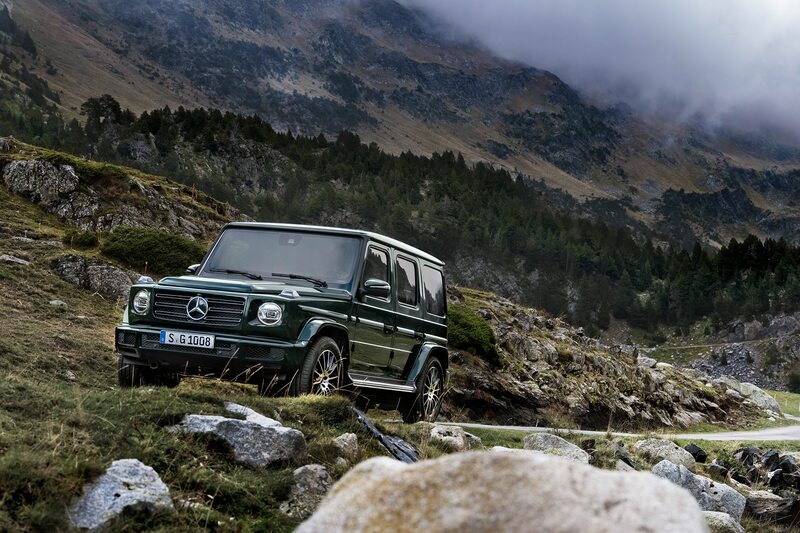 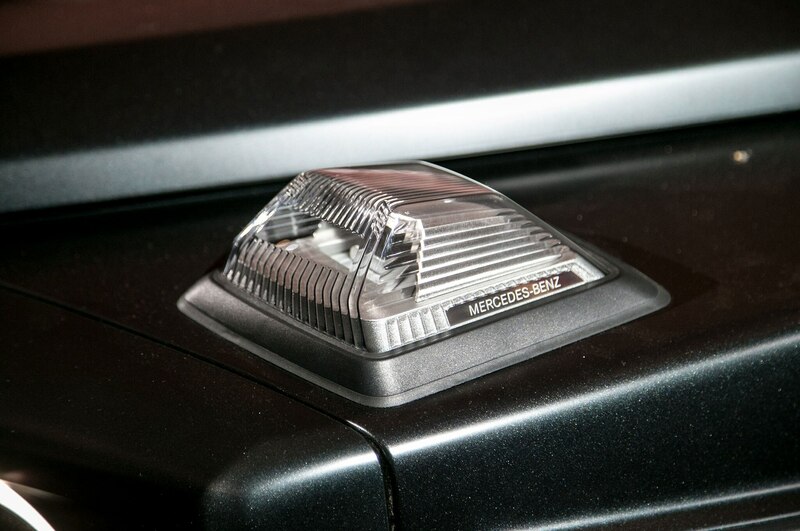 This power is managed by Mercedes’ 9G-TRONIC nine-speed automatic transmission. 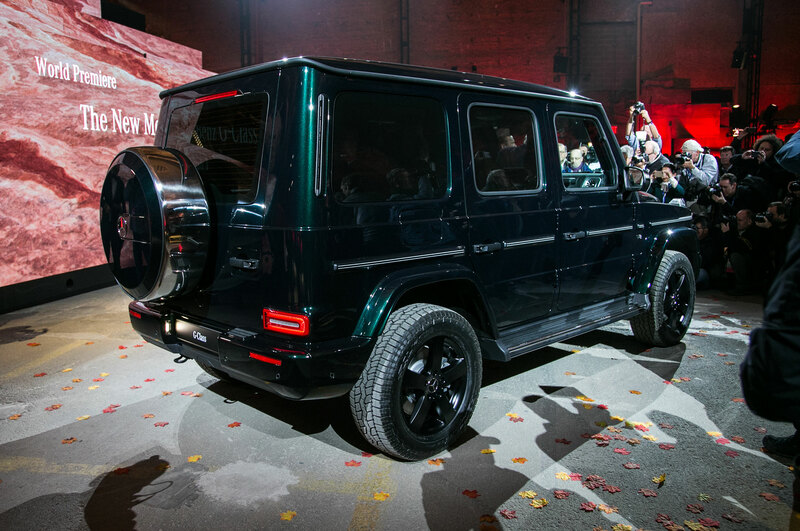 Pricing, weight, and 0-60 mph has yet to be announced, but in keeping with tradition, it’s safe to assume it’s very expensive, quite heavy, and surprisingly fast. 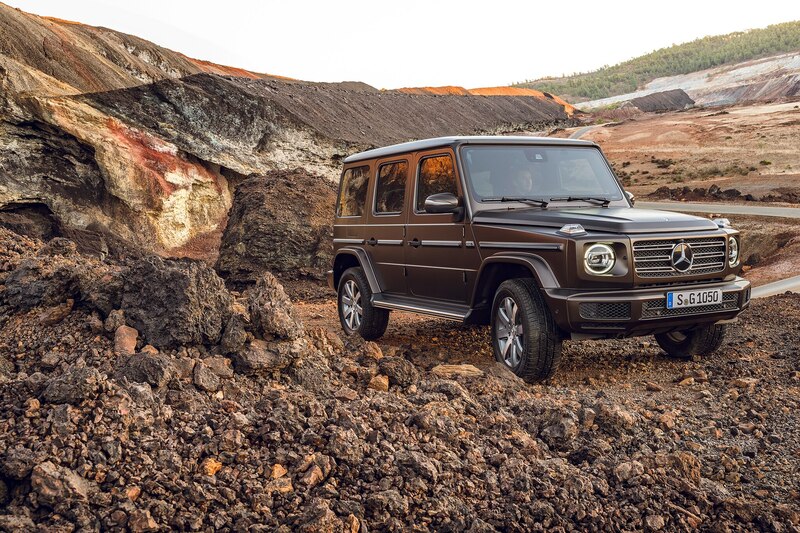 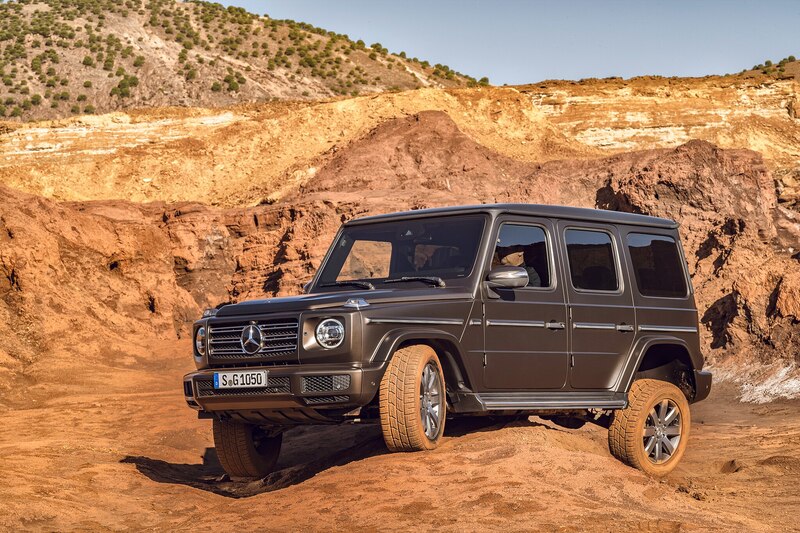 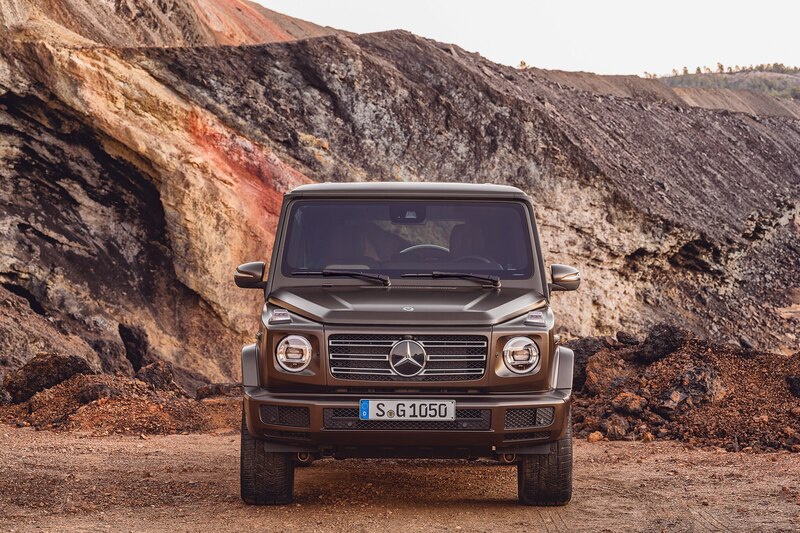 Look for further details on the 2019 Mercedes-Benz G550 later on this year.